Last month, NATO’s commanders in Libya went with caps-in-hand to the Pentagon to ask for reconnaissance help in the form of more Predator drones. “It’s getting more difficult to find stuff to blow up,” a senior NATO officer complained  to The Los Angeles Times. The Libyan rebels’ envoy in Washington had already made a similar request. “We can't get rid of [Qaddafi] by throwing eggs at him,” the envoy told the newspaper. The Pentagon told both camps it would think about it, citing the need for drones in places like Yemen, Somalia, and Pakistan, where Predator strikes have killed dozens this month alone. So why doesn’t NATO or the rebels do what Cote d’Ivoire’s Air Force, Mexican police, and college student peacekeepers have done--buy, rent, or build drones of their own? The development of deadly hardware and software is leading to a democratization of war tech, which could soon mean that every army--private or national--has battalions of automated soldiers at their command. “Drones are essentially flying--and sometimes armed--computers,” the Brookings Institution noted in a paper  published last month. They’re robots who follow the curve of Moore’s Law rather than the Pentagon’s budgets, rapidly evolving in performance since the Predator’s 2002 debut while falling in price to the point where Make magazine recently carried instructions on how to launch your own satellite for $8,000. Since the Predator first appeared above Afghanistan nearly a decade ago, the Pentagon’s inventory of drones has risen from less than 50 devices to more than 7,000. But the gap between the U.S. and its closest competitors may actually be shrinking. China, for example, has pinned its military ambitions  on 2,000 missiles guided by target data from some two-dozen models of surveillance drones. The worldwide drone market is projected by the Teal Group to be worth $94 billion over the next decade, led by the Pentagon, which has asked Congress for $5 billion for next year's expenses alone. One reason for the ballooning arms race between anywhere from 44 to 70 nations (depending on which estimate you believe) is self-interest. 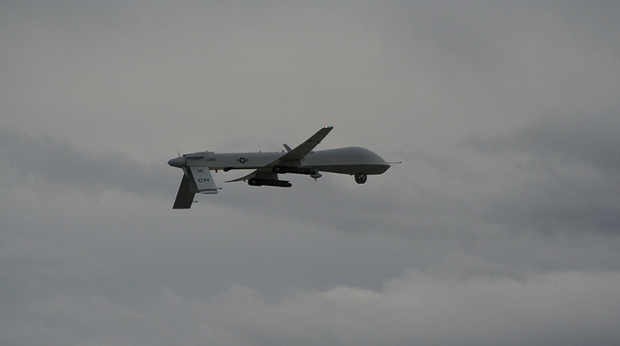 So far, the Pentagon has refused to share its toys, instituting tight export controls on drones like the Predator or Reaper, both of which are made by General Atomics. Another is purely financial. An F-22 stealth fighter costs $150 million, roughly 15 times a top-of-the-line Predator. The U.S. military’s blank check of a budget--more than the rest of the world’s combined--means little and less  when the cost of drones keeps falling. But the most important factor may be doctrinal. Unlike the U.S., which is still feeling its way forward with robotic warriors while entrenched generals fight for their tanks and aircraft carriers, small nations with shrinking budgets stand to gain the most from embracing robotic warfare. In 2004, French troops arrived in Cote d’Ivoire to help police a cease-fire in the country’s simmering civil war. Not expecting trouble, they left their air defenses at home. But on November 4, 2004, a pair of Israeli-made Aerostar drones circled their base, reconnoitering targets for the Russian-made jets which bombed them a few hours later, killing nine soldiers and a U.S. aid worker. The drones belonged to an Israeli private military firm hired by Ivoirian president Laurent Gbagbo, who claimed (unconvincingly) that the whole thing was an accident. Today, they would toss the project on Kickstarter and build their drone using Arduino modules developed by hobbyist sites such as DIY Drones. In a recent essay , the consultant and futurist Scott Smith noted that both the “maker” movement and the Libyan rebels desperately hacking together weaponry are drawing on the same open source knowledge base. Or for that matter, so are the Mexican drug cartels assembling their own tanks and submarines. “We’ve come to a point where you put together a parallel system to the U.S. Department of Defense,” says Smith. And also to the point where the DoD is soliciting the hobbyists themselves to be the next generation of weapon designers via DARPA’s crowdsourcing effort, UAVForge . “If I were at a major arms contractor, I would be worried about being disrupted,” Smith says. He wonders if the world is headed toward “peak arms,” in which open source, distributed, low-cost tools fatally undermine big-ticket weapons sales in all but a few cases (most of them involving the Strait of Taiwan). And that goes double for non-state actors, e.g. roll-your-own NGOs and drug cartels. “The era of large scale, run-and-gun DIY micro-warfare is just around the corner,” Smith concludes. The trajectory of drones and warbots is the same as computing in general--smaller, cheaper, more ubiquitous. In February, AeroVironment unveiled the prototype  of a hummingbird-sized drone that can perch on a windowsill can peer in. Insect-size is next. 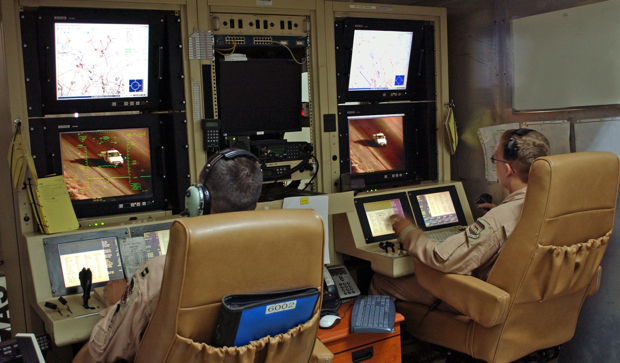 But the shift from a single pair of eyes in the sky to a swarm of bots would create havoc with U.S. military doctrine, which requires having a human operator at all times, or a “man in the loop.” This is one reason why the Air Force is training more remote pilots this year (some 350) than bomber and fighter pilots combined. Then again, that’s not nearly enough for 7,000 drones, let alone 7 million, all of which would have the intelligence to fight or fly on their own, with faster-than-human response times. That’s why the definition of "in the loop: is blurring from direct human control “to a veto power we’re unwilling to use,” says Singer. In the case of missile defense systems already in use, “you can turn it on or off,” but you can’t pick and choose which bogeys to shoot. “The speed and complexity is such that the human interface has to be minimized to be effective,” he adds, which suggests the generals in WarGames were right all along. Or were they? Releasing increasingly autonomous warbots into the wild will demand new algorithms to command them, raising the specter of a “flash crash” on the battlefield as opposing algorithms clash and chase each other’s tails. Or what if hackers were to assemble a botnet for real: an army of machines ready to do their bidding? Perhaps a decade from now, there will be no “cyber-war .” There will only be war.